Bee Wooden Sharpener is a lovely little wooden pencil sharpener in lovely black and yellow stripy bee colours. This novelty stationery toy has a plastic sharpener recessed into its base. 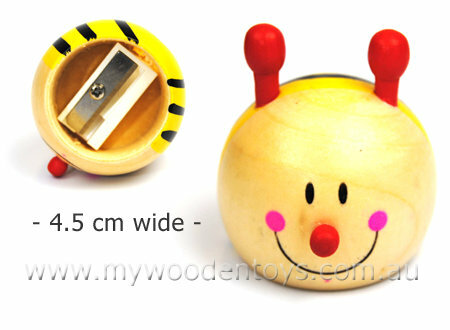 The little sharpener has smiley bee face red antennas and a tiny nose. This is a great addition to a stationery set and is strong and well made. Material: Wood, plastic sharpener sharp metal blade. We like this because: "Great detail on this sweet sharpeners face, lovely little stationery toy."